For several summers as a kid, my little brother and I had lots of adventures in nature learning how to tent camp. Now, my parents weren’t really campers, so these adventures took place with my Grandma and my Aunt. Mostly, we camped in The Shawnee National Forest because our trips focused on Native American Pow Wows that my Grandma and Aunt wanted to visit. We camped because it was more affordable, and my Grandma loved camping. If I remember correctly, her adventurous spirit even took her clear out to Montana once, by herself, for a camping trip. Without a doubt, I know my love of camping came from those adventures and what my Grandmother passed down to me. It was so fun being a kid out in the woods or on the trails, taking in the sights, sounds, and smells of the outside world. The woods held a sense of wonder for me that I’ve never found anywhere else. I hit the jackpot when I discovered my hubby was a nature guy, too. But surprisingly, we haven’t camped as much as I would’ve liked over our first eight years together. Marriage is a journey though, and it’s taken us a while to discover the things we love to do together. But as God works, I found it a bit of serendipity that just as we started talking about summer vacation plans this year, we discovered Penny Lane this past weekend, setting us off on a lifetime of adventures. A couple of summers ago, Casey headed out to Colorado on a men’s hiking trip. With his pack full of everything he needed, he spent a week hiking, camping, and living in the mountains. That trip renewed his sense of wonder for nature, and all of the preparations we made reminded me how much I love everything about camping and hiking. When he got back, we started talking about finding a camper and being more purposeful about getting out in nature as much as we could. Fueled by a little bit of jealousy at his trip (just being honest here) I jumped into researching campers because I was ready for many adventures together. 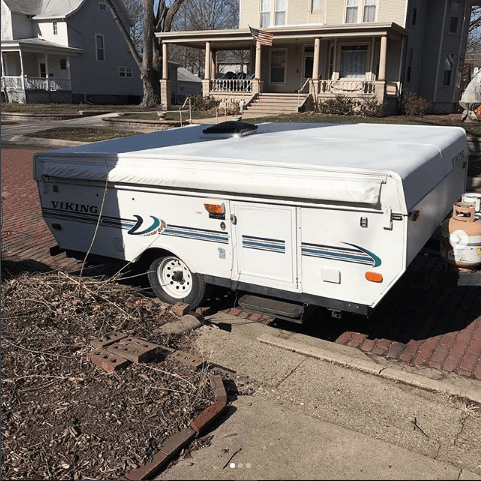 Sure, we had everything we needed for tent camping, but living in central Illinois, there aren’t a whole lot of great hiking getaways close by, so we thought a camper would allow us the fun of road tripping places for more camping adventures. 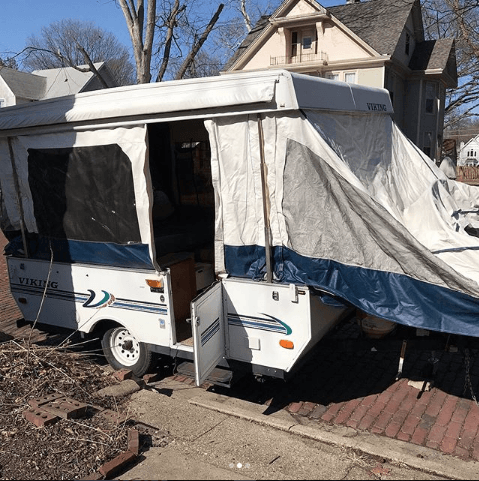 Fast forward a bit and I found my dream camper, but for the price of a small car it wasn’t in our budget. We kept looking, but last summer ended up being a summer of other travel, so camping got pushed to the side. Come Fall we still had the nudge though, and decided to get back to looking for a camper, hoping for just the right find. We didn’t want a giant RV or 5th wheel because glamping isn’t our style. We wanted something smaller, that would also be good for camping with kids someday, and didn’t need a lot of work. But, to no avail, everything was either too big, too expensive, or needed too much work. Winter passed by slowly and vacation talk started. We started looking for campers again, and after months of searching and dreaming, Penny Lane landed in our lap. She was the perfect size, within our budget, and a pop-up that didn’t need any work! Now that I’m not a kid anymore, I realize it sure was brave of my Grandma and Aunt to tent camp with us, sleeping on the ground, fighting the rain some days and nights. Don’t get me wrong. I’ll still tent camp in a heartbeat (which we do in our backyard occasionally) but when we found Penny Lane, we saw years of adventures ahead of us. A pop-up felt perfect to us because it’s still very much like tent camping (she doesn’t have an air conditioner) but with some added room. She has a pullout Queen size mattress, Full size mattress, and the table folds down to a twin. Plus there’s a little dinette with a mini fridge, microwave, sink, and propane hookup for a camp stove. We don’t have any elaborate vacations planned for summer, but instead we’re planning on weekends spent camping, connecting with nature again. I want to get lost in the woods, disconnect from the web, and reconnect with my soul because as I’ve gotten older, I’m quite positive it resides in the woods. As Thoreau says, I want to go into the woods so that I may live deliberately, and learn what it has to teach me. I think there’s much we can learn when we purposefully step out of our everyday lives, power down from being connected, and simply just be in the world as it once was. Camping can be tedious and often needs a lot of preparation before venturing out, but once your lists are complete, the vehicles are packed, and you pull up to your campsite, a whole world of wonder awaits. I can’t wait to see what nature has to teach me this year. How about you? 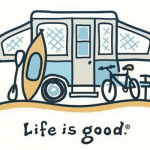 Do you enjoy the camping life?